We humbly implore your mercy, Lord: protect us in all dangers through the prayers of the Bishop Saint Nicholas, that the way of salvation may lie open before us. Through our Lord Jesus Christ, your Son, who lives and reigns with you in the unity of the Holy Spirit, one God, for ever and ever. St. Nicholas was born in Lycia, Asia Minor, and died as Bishop of Myra in 352. He performed many miracles and exercised a special power over flames. He practiced both the spiritual and temporal works of mercy, and fasted twice a week. When he heard that a father who had fallen into poverty was about to expose his three daughters to a life of sin, Nicholas took a bag of gold and secretly flung it through the window into the room of the sleeping father. In this way, the three girls were dowered and saved from mortal sin and hell. Saint Nicholas, bishop of Myra, is undoubtedly one of the most popular saints honored in the Western world. In the United States, his memory has survived in the unique personality of Saint Claus — the jolly, rotund, white-bearded gentleman who captivates children with promises of gifts on Christmas Eve. Considered primarily as the patron saint of children, Nicholas is also invoked by sailors, merchants, bakers, travelers and pawnbrokers, and with Saint Andrew is honored as the co-patron of Russia. In spite of his widespread fame, Saint Nicholas, from the historian's point of view, is hardly more than a name. He was born in the last years of the third century in Asia Minor. His uncle, the archbishop of Myra in Lycia, ordained him and appointed him abbot of a nearby monastery. At the death of the archbishop, Nicholas was chosen to fill the vacancy, and he served in this position until his death. About the time of the persecutions of Diocletian, he was imprisoned for preaching Christianity but was released during the reign of Emperor Constantine. 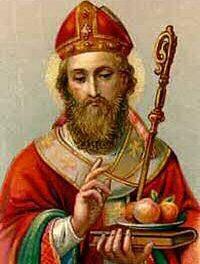 Popular legends have involved Saint Nicholas in a number of charming stories, one of which relates Nicholas' charity toward the poor. A man of Patara had lost his fortune, and finding himself unable to support his three maiden daughters, was planning to turn them into the streets as prostitutes. Nicholas heard of the man's intentions and secretly threw three bags of gold through a window into the home, thus providing dowries for the daughters. The three bags of gold mentioned in this story are said to be the origin of the three gold balls that form the emblem of pawnbrokers. After Nicholas' death on December 6 in or around 345, his body was buried in the cathedral at Myra. It remained there until 1087, when seamen of Bari, an Italian coastal town, seized the relics of the saint and transferred them to their own city. Veneration for Nicholas had already spread throughout Europe as well as Asia, but this occurrence led to a renewal of devotion in the West. Countless miracles were attributed to the saint's intercession. His relics are still preserved in the church of San Nicola in Bari; an oily substance, known as Manna di S. Nicola, which is highly valued for its medicinal powers, is said to flow from them. The story of Saint Nicholas came to America in distorted fashion. The Dutch Protestants carried a popularized version of the saint's life to New Amsterdam, portraying Nicholas as nothing more than a Nordic magician and wonder-worker. Our present-day conception of Santa Claus has grown from this version. Catholics should think of Nicholas as a saint, a confessor of the faith and the bishop of Myra — not merely as a jolly man from the North Pole who brings happiness to small children. Many countries and locations honor St. Nicholas as patron: Greece, Russia, the Kingdom of Naples, Sicily, Lorraine, and many cities in Italy, Germany, Austria, and Belgium. Excerpted in part from Lives of the Saints for every day of the Year, Volume III © 1959, by The Catholic Press, Inc.
Patron: against imprisonment; against robberies; against robbers; apothecaries; bakers; barrel makers; boatmen; boot blacks; boys; brewers; brides; captives; children; coopers; dock workers; druggists; fishermen; grooms; judges; lawsuits lost unjustly; longshoremen; maidens; mariners; merchants; murderers; newlyweds; old maids; parish clerks; paupers; pawnbrokers; perfumeries; perfumers; pharmacists; pilgrims; poor people; prisoners; sailors; scholars; schoolchildren; shoe shiners; spinsters; students; thieves; travellers; unmarried girls; watermen; Greek Catholic Church in America; Greek Catholic Union; Bari, Italy; Fossalto, Italy; Duronia, Italy; Portsmouth, England; Greece; Lorraine; Russia; Sicily. Often Portrayed As: Bishop with three children in a tub at his feet; Bishop calming a storm; bishop holding three balls; bishop holding three bags of gold; bishop with three children. Today is a good day to teach your children the difference between Santa Claus and St. Nicholas. This story of the origin of Santa Claus will help you. Also learn all you can about St. Nicholas. Read St. Nicholas of Bari, ancestor of Santa Claus. Choose some of the recommended activities — a puppet show, a party, a visit from "St. Nicholas." Make sure to include in all the activities the story of St. Nicholas, virtues to imitate, and his significance in the Advent season. Read how different countries Celebrate the Feast of St. Nicholas. To enhance your feasting, purchase a copy of the CD by the Anonymous 4 Legends of St. Nicholas. This is medieval music, all in honor of St. Nicholas, done by four female vocalists. There are numerous recipes to enhance this feast, anything from a soup to dessert, so have fun in the kitchen trying different ones. St. Nicholas did his charitable works secretly. Suggest that your children do one hidden act of kindness in imitation of the saint. From the Netherlands we have the most popular recipe, speculaas (or St. Nicholas Cookies; Speculaus; Speculatius; Kris Kringle Cookies; Dutch spice cookies). You can find tips for using special speculaas cookie molds by Gene Wilson. Try these sites for St. Nicholas Cookie cutters or molds: House on the Hill, HOBI Picture Cookie Molds, Rycraft, and St. Nicholas Center. You could also use Nativity Cookie Cutters, like these from Cookie Craft.